For many who are settling into a new home or preparing for the birth of a child, the time may be right for a home renovation. After all, a renovation increases the long-term value of your property, and it can provide the unique features that you’ve always imagined, to turn your regular house into your dream home. Many who choose to pursue a home renovation look at their kitchen and bathrooms first; that’s because your kitchen and bathrooms are the rooms that homeowners and visitors alike will see very often, and a brand new kitchen or bathroom can quickly make your home the envy of your friends. Additionally, some of the new technological upgrades to kitchens and bathrooms, from hydrojet jacuzzis to smart countertop ovens and refrigerators will truly amaze your guests. 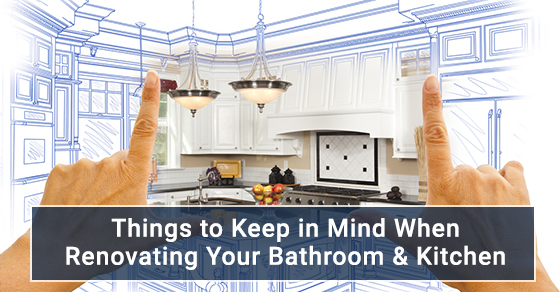 But when embarking on a kitchen and bathroom renovation, there are a number of key insights to keep in mind, and that’s where we’re here to help. It’s important to remember that your renovators are your partner in achieving your ultimate vision – so don’t hesitate to share with them what that is! You’ll be welcoming your renovators into your home, so they should be open to discussing multiple ideas and unorthodox suggestions. For example, some people imagine an open concept kitchen, but they assume that having a wall or staircase in an inopportune area of the home prevents that. However, you may find that your renovators are more than willing to accommodate your requests – as long as you make clear to them what they are. Many renovators have skills and expertise beyond their advertised specialties, or they know the right person for the job. So don’t limit yourself to the first few ideas or suggestions – your renovation is your chance to achieve what you’ve always wanted for your home, and your renovators are there to help you every step of the way. You might be surprised at what you can accomplish together! If you have ever performed home renovations before then you may have realized just how quickly things can get out of hand. Some people simply dive into bathroom and kitchen renovation projects, and figure they will learn as they work, but this is generally not an advisable strategy Instead, take the time to determine what you can truly afford, and make a vow to not exceed your allotted budget. In some cases, you may work on the renovation work yourself, which may be cheaper but may also be riskier, while in other cases you may need to call in a professional. Perhaps you will split the parts and labour evenly between two parties. Rates may also be affected by season, time, and the scope of the project, and renovation products may also increase in price due to newfound demand, so all of the above need to be factored into the monetary budget as well as the estimated timeframe of completion. In other words, calculate a number that you can truly afford and then begin to slowly allocate numbers for the tiling, floors, and fixtures. You may want to look into purchasing products for your bathroom and kitchen that are environmentally sustainable. Making your bathroom and kitchen eco-friendly will not only help you do your part for the environment but will also save you some green on your monthly utility bill. From low flow toilets to vanities that are only made with sustainable wood sources, there are several ways in which you can go green while still meeting your logistical and aesthetic goals for your bathroom and kitchen. Some people like to have their bathroom walls be adorned with beautiful tiles, but this is impossible to do if you have a pocket door. This is because a pocket door will cause your tiles to become loose as the door moves back and forth. Instead, you may have to opt for panel moulding behind the bathtub or change the type of door. On that note, obstacles will come up during the renovations that will prevent you from meeting your deadlines, and that’s perfectly okay. Try to be generous in terms of scheduling, and anticipating obstacles such as products being out of stock, labour disputes, weather conditions, and other such issues, so that you will be prepared for anything. Begin by going through what you currently have in your bathroom and kitchen. Perhaps you may discover that you are using all of your storage, which may necessitate additional storage units. Or, you may have plenty of room to spare, which may indicate that downsizing may be a better option in order to reduce costs. As for cabinets and shelving units, ensure that the units that you do end up purchasing and installing adhere to the functionality requirements that you and your loved ones require. For more information on maintaining and renovating your home, call Avonlea Renovations at 416-907-7891 or contact us here.